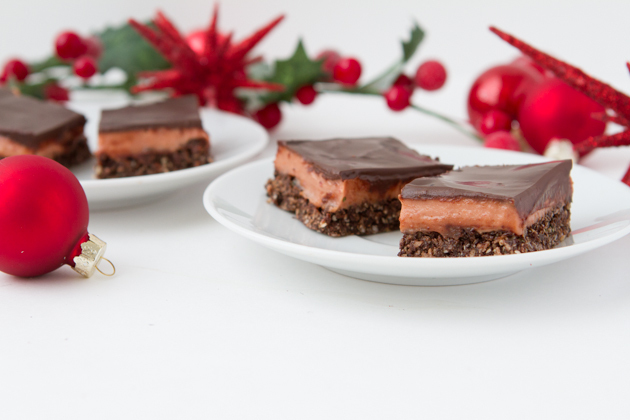 Lightly sweetened chocolate layer bars – a healthy hemp seed base and melted chocolate coating, sandwiched between a dense layer of cranberry cream. Add bottom layer ingredients: tahini, coconut nectar and vanilla extract to a medium-sized bowl. Stir to combine, then add cocoa powder. Mix until incorporated. Add shredded coconut and hemp seeds to the bowl. Stir until everything is covered in the chocolate mix. You may want to use your hands. Once complete, press mixture into a parchment paper lined 8×8 baking sheet. Press firmly and set aside. Meanwhile, add middle layer ingredients: cranberries, xylitol, vanilla and 1 tablespoon of Osteo Calm to a small saucepan. Heat on medium-high heat until it boils, then reduce heat to low and simmer, covered, for 10 minutes. Once complete, transfer to your high-powered blender. Add remaining Osteo Calm, cashews and coconut oil. Blend until smooth. Spread cranberry mixture over top of the chocolate hemp crust. Pour melted chocolate over top and spread with the back of the spoon, being careful not to mix the layers. Transfer dessert to the fridge and allow to cool for at least 4 hours. 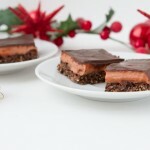 When ready to serve, remove from the fridge and use a warmed knife to cut through the hard chocolate. Store in the fridge for 3-4 days or freezer for up to 1 month.